Following up last month’s meeting with Living Streets we heard that Living Streets were progressing setting up a Newham branch whichÂ some Newham Cyclists were likely to join. Â ThisÂ would maintain co-ordination. 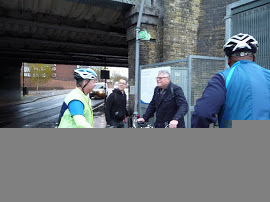 Following last month’s meeting on Forest Gate Crossrail related improvemetns, a collective NewhamÂ CyclistÂ response has been given to this consultation as well as well as other consultations Â on Manor Park and the Silvertown Tunnel. Â These to reinforce the individual responses. There wasÂ a very positive meeting with Councillors Terry Paul and John Gray over the Greenway closure. Â Interestingly,The day before this meeting the signage had been improved by Thames Water. Â Notable also was the number of people cycling in the area and the number that stopped to voice their opinions. ThereÂ is hope for the end to the closure from West Ham station to Stratford by AprilÂ next year, with some limited provisional access before thenÂ The reopeningÂ Â paves the way for the planned improvements for the Greenway as part ofÂ Â TfL Â second round of quietways – in this caseÂ 24hr opening and lighting, and Â 4 additional ramps for access. Â The closure on the northern side is more uncertainÂ despite the overrunning Crossrail related worksÂ coming to end. We are seeking a similar engagement with these two local CouncillorsÂ to look at the multiple issues surrounding Stratford High Street and the Stratford Gyratory. Â To the obvious ones can be added the frequent parking of construction traffic Â blocking the shared use pavement. Some more works on the Victoria Park to Hainault Quietway have started in Forest Gate. Â We noted that theÂ introduction of a CPZ had led to more parking in Cemetery Rd to the detriment of the route as a Quietway. Â We agreed that we could not endorse this Quietway unless the crucial junctions were suitably addressed. We decided to go ahead with some traffic counting pilots. We noted the recent poll in the Newham RecorderÂ on cycling issue. Â Steve Smith put forward an excellent case for cycling. We decided to seek a catch up meeting with Newham’s Sustainable Transport Officer in the New Year. We noted that further cycle parking has been casually removed without replacement by Newham Council – this time outside Wilkinson’s in Stratford. On street secure parking has been installed by Newham Council in various locations. Â A welcome development. Â All were urged to identify further suitable sites.